Wallaby Financial, a startup that’s building a cloud-based wallet that will optimize the rewards, points, airline miles, and other benefits consumers earn when charging purchases, has just closed a seed round of $1.1 million. The round was led by Founders Fund Angel and included participation from WI Harper Group, SLP Ventures, Lion Wells Capital and other individual investors, including some former Green Dot executives. The startup also had some backing from Santa Monica-based MuckerLab, where it was a member of that incubator’s inaugural class this year. Now, I know what you’re thinking – another startup building a wallet? But before you roll your eyes, wait; this one is interesting. Well, at least it’s doing something unique. Wallaby will offer customers a universal credit card. Yes, a physical card. One card to rule them all. With some programs, there are bonus categories which change every three months or twice a year, he explains. Others have limits and restrictions, which means that the consumer has to always be thinking about which one to use in order to get the best deal. “We think that’s overly difficult for consumers, and that’s a problem that can be solved with technology,” says Goldman. 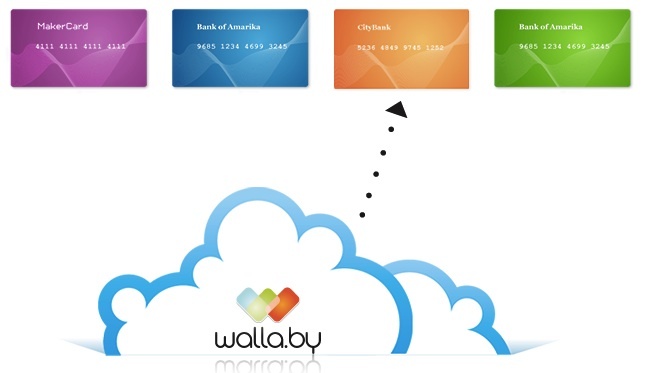 Wallaby’s solution, then, is a cloud-based digital wallet which is presented to consumers as a physical, “swipeable” credit card. The card will carry a network brand (it’s either Visa or MasterCard, but Goldman hasn’t received permission to state which one yet), so it can be used just like any other credit card anywhere that brand is accepted. However, the card will be connected to all the other cards consumers carry, routing transactions to the appropriate card based on the consumer’s preference. Oh, and here’s the kicker – this routing will be done in real-time. Consumers will be in control of what those preferences are, telling Wallaby that they want to maximize airline mile accumulation, for instance, or that they’re mainly concerned with getting the most cashback for their purchase. Based on these rules, Wallaby will make a real-time decision about where to route the payment. Then, after getting the authorization from whichever credit card was selected, it will send the approval back to the merchant. Does this process slow down transaction times? Not much, but some, Goldman admits. “It does make it a little bit slower, but not noticeably so – under a second,” he says. “Usually what takes the longest time after swiping the card is actually the transaction getting from the store into the payment network. A lot of stores still use a modem to do that,” he says. And Wallaby’s decision-making process is sub-600 milliseconds on its end. The speed comes comes courtesy of co-founder and CTO Todd Zino, whose previous company DemDex was acquired by Adobe. Although that company was focused on ad-targeting, not payments, there’s similar know-how involved in designing a system that can make a decision rapidly – whether that’s which ad to display or which card to select. Wallaby had previously opened up its beta for sign-ups back in June, but Goldman now says that it will still be a few months before it “opens the floodgates,” allowing anyone to create an account. Like Simple, and other startups operating in the financial services space, there are risks involved requiring slower, staged rollouts. That said, the company has already managed to waitlist over 10,000 users since June. Further down the road, Wallaby plans to do more than just smartly selecting the right credit card. It also aims to support debit cards, store cards and even gift cards. It could also work towards selecting cards based on balances, limits, or interest rates, and helping with bill pay, perhaps. “Our vision for the company is to really bring intelligent automation to a variety of financial services for people and help them achieve their goals,” says Goldman. Sign-ups are being accepted on Wallaby’s homepage here.